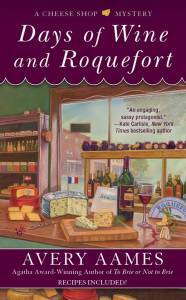 DAYS OF WINE AND ROQUEFORT by Avery Aames and a fantastic giveaway!!! DARYL WOOD GERBER aka AVERY AAMES. As Daryl, she writes the nationally bestselling Cookbook Nook Mystery series. As AVERY, she pens the Agatha Award-winning, nationally bestselling Cheese Shop Mystery series. Daryl’s short stories have been nominated for the Agatha, Anthony, and other awards. 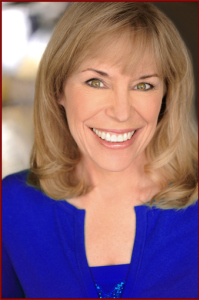 Fun tidbit: as an actress, Daryl has appeared in “Murder, She Wrote” and more. Visit Daryl aka Avery at www.darylwoodgerber.com. Check out recipes on her blog www.mysteryloverskitchen.com and friend her on Facebook. Don’t forget to enter today’s contest. The prize is 4 (yes 4!!!) Cheese Shop Mysteries and the first Cookbook Nook Mystery. To enter, first comment below then go HERE. Now join me in welcoming Avery (or Daryl??). I was going to say welcome to Providence, Ohio from Providence, Rhode Island but then I found out yours isn’t real! LOL… Having been an actress you are used to playing many characters so this may not be as much a problem for you as others, but do you ever get confused writing under two names? Autograph a book wrong or just forget who you are supposed to be? I realize artistic people are frequently talented in multiple fields but actress and writer – have you ever worked in a steady nine to five with a weekly paycheck (or wanted to) and what job was it? I did work as a legal secretary for a couple of firms, including a personal injury firm and a golf company that did real estate. I also sold real estate, ran a restaurant, catered parties, and typed screenplays for authors. The 9 to 5 thing really didn’t work for me. I like structure that I create for myself, and I like to be my own boss. No question about that! Interesting. I too was a legal secretary and a Realtor®. I have also read your previous Cheese Shop Mysteries and love them. Why a cheese shop? Are you something of a cheese expert or do you, like me, just love cheese? When I started the Cheese Shop Mysteries, I was not a cheese expert. I’m still not. But I have tasted over 3,000 cheeses by now, and I have an excellent cheese maven who helps me with tweaking my selections. Also, I’m a good researcher. J And I am a cook. I have been all my life. I love food. I blog on Mystery Lovers Kitchen with other mystery authors who love to cook up crime. We put up recipes every day! By the way, DAYS OF WINE AND ROQUEFORT also features wine. I’ve made it a point to do my research in that regard, too. Lucky me! Do you know what is coming after DAYS OF WINE AND ROQUEFORT and can you share it with us? Next up in March is the 2nd in the Cookbook Nook Mysteries: INHERIT THE WORD. This book features a grilled cheese contest! After that, there’s the 3rd in that series coming out in October: STIRRING THE PLOT. (There’s a witch theme, but it is by no means paranormal.) And then next February, the 6th in the Cheese Shop Mysteries debuts: AS GOUDA AS DEAD. I just finished writing that book, and I’m thrilled with it. When I’m not writing, I like to cook, do photography, swim, golf, and play with my dog. My husband and I are doing a bit more travel, too. We both like to golf, and we both like to read. It makes for very pleasant vacations! What is your favorite TV show? Revenge. I apologize. I know it’s a soap opera, but I’ve been sucked into it. I love the lead character. I feel the pain of her father’s loss. I’ve lost my own. What is your favorite music? I love music I can sing, so I’m always looking for strong female vocals. I enjoy Broadway music, classical music. And right now, while writing my latest book, I’ve been listening to Latin music. I find inspiration from it all. Thank you so much for being here today, Avery aka Daryl. Is there anything else you would like to tell the readers before you go? Remember to sign up for my newsletter so you’re involved in all the upcoming contests. I include recipes in all of them, too. And stop by Mystery Lovers Kitchen for giveaways through the month of February! ← Join me for PICKING LEMONS and a giveaway! This was very interesting. I think I would really forget which name I was using more than one time. I’ve enjoyed all the cheese shop mysteries and am looking forward to reading the new one. I want to read the Cookbook Nook mysteries also. What a great interview; I learned a few new things about Avery/Daryl that I had not known or remembered reading before this. Thank you. 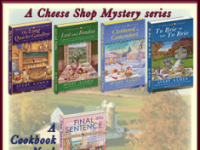 I would love to be the recipient of the latest book in the Cheese Shop Mystery series. I have read one or two others written by this author, and they are all wonderful. I have another already purchased but just didn’t get to read it yet. I am hoping to get this current book and preorder the next although it will be quite sometime (a year) to wait for it. Guess that says it all; this writer is wonderful and if someone has not read anything by her yet, do yourself a favor and get some of her books. Thanks again for the interesting blog post. Loved this interview!!! I do enjoy this series very much and can’t wait to read the next books. This is one reader, she certainly does please! I’ve somehow missed the cheese shop mysteries, but now I’ll be looking out for them. I love foodie type cozies and cozies that are involved with the book world. Right now I’m actually on a cozy foodie book binge, with no plans to diet soon. How wonderful would it be to win these “cheesy” book that aren’t really cheesy!! really enjoyed the interview! I love any kind of mystery that also involves cooking and good food! I love this series and the characters and the recipes.